India Beat recently visited Ranvas and loved the calm beauty of the hotel. The former royal zenana (Queen’s apartments) of this massive fort have been renovated to create a superb hotel. Amazingly, beyond the hotel walls the whole fort is painstakingly being restored and archeologists work on the restoration throughout the year. It’s fascinating to walk out of your room and straight into an archeological project. The scale of the work is breathtaking and the quality of the craftsmanship that is bringing this spectacular Palace Fort back to life is extraordinary. 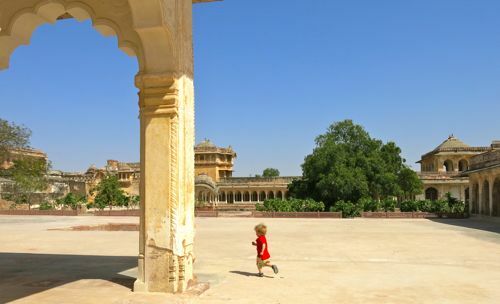 India Beat can arrange for guests to have a private tour of the restoration work with the curator of the Mehrangarh Trust who is responsible for the restoration work. Back at the hotel we relaxed by the pool and feasted on the delicious Indian food, for anyone interested in history, Rajput culture and beautiful architecture this is a true paradise.